This research investigates various issues in air-sea/ice interaction associated with the transfer of momentum, heat, moisture, trace gases, and particles at the wavy interface of the ocean. 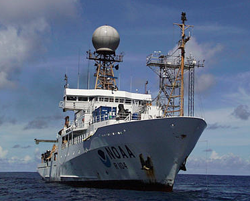 Goals include analysis and forecasts of weather, climate, and environmental conditions over the oceans and in coastal zones. The principal focus is on fluxes: measurement techniques, studies of fundamental physical processes, and development of simplified representations of those processes. The group also deals with the scope of interactions (atmospheric or oceanic) from the microscale to boundary-layer scales. The work has application in various areas such as operational weather forecasting, global climate modeling, air quality, assessment of CO2 trends, improving satellite retrievals, and understanding air-sea-interaction mechanisms affecting hurricane intensity. Developed advanced techniques to measure air-sea turbulent fluxes from ships and with this unique data we developed a new flux parameterization that is now being incorporated into high-resolution mesocale models and global climate models. A new parameterization of sea spray fluxes is being used in research on the formation of hurricanes. Data from numerous division field programs has been used to improve satellite algorithms. Research in wind-wave coupling will lead to better forecasts of wave heights for ships on the open ocean and coastal regions. Advances in the extraction of turbulence and cloud information from surface-based remote sensors (Doppler radar and lidar) will lead to a new approach for developing boundary layer models for weather and pollution forecasting. Techniques learned from turbulence and cloud studies have been applied to study the effects of clouds and cloud properties on the surface energy budget of the ocean and the Arctic ice cap. The sensitivity of this surface cloud energy forcing to climate regime (equatorial, trade, subtropical, storm- track, and polar) has demonstrated the overwhelming climate importance of clouds. Developing a new technique with collaborators to measure CO2 fluxes over the open ocean. This is an important step in assessing the role of oceanic uptake in the global CO2 budget and the likely effectiveness of controls on usage of fossil fuels and land clearing. 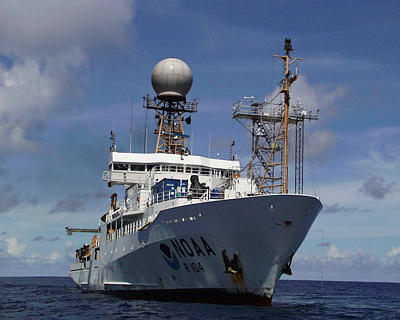 Through these widely distributed field programs, a unique database of surface fluxes, boundary-layer physical properties, and cloud information has been collected, which represents a major resource for researchers working on marine atmospheric problems.